We work with rod builders and manufactures to provide fishing rods of high quality for an affordable price. Rods designed for the use of spinning reels. 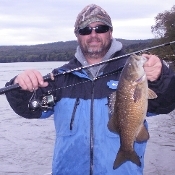 Looking for the right rod to fish for river smallies, here it is.